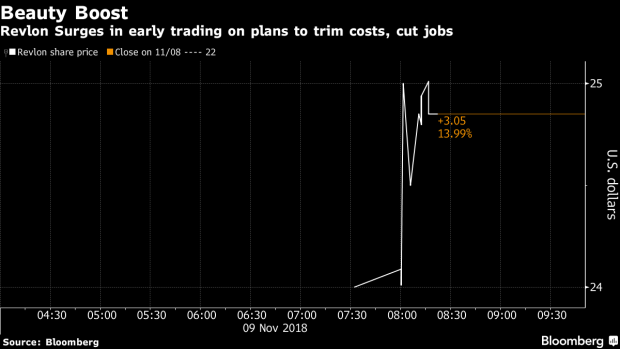 (Bloomberg) -- Revlon Inc. jumped in early trading after the cosmetics giant said it will reduce costs by as much as $150 million by the end of next year in a plan that will include job cuts. Revlon is reallocating resources to focus on “higher-priority growth areas,” Chief Executive Officer Debra Perelman said in a statement Friday. She said the plans will lead to some headcount reductions. Revlon has struggled to turn around its business as it fends off a growing field of competitors. Specialty beauty stores and online-only concepts have rattled the cosmetics industry. The company is already making some progress. Profit rebounded in the third quarter from a loss a year earlier. “Revenues have steadied and they got a little margin momentum,” said Bloomberg Intelligence analyst Noel Hebert. The shares surged as much as 15 percent in premarket trading to $25.01. The stock had been unchanged this year through Thursday’s close, compared with the 5 percent gain in the S&P 500 Index. For more details on the quarterly results and cost-cut plans, click here.